If you are looking for a way to conveniently pass mail and other documents from one work area to another, then take a look at StoreMoreStore’s Pass Thru type sorters. These dual sided open back sorters allow you to place your mail and literature in one side of the sorter and retrieve it from the other side of the sorter. For example, you can mount Pass Thru Sorters in the wall of your mailroom to allow mailroom staff to sort mail into slots from inside the mailroom and employees to retrieve mail from outside the mailroom. This type of Pass Thru sorting equipment saves time distributing mail to various offices by mailroom personnel. Doors can be added to the pass thru sorters for additional security if required. • Easily Adjustable Sorter Shelves: Sorting shelves and trays slide in and out on tracks making opening heights between shelves easy when your document and mail sorting storage needs change. • Easy to Read Sorter Shelf Labels: Sorter trays or shelves offer full length name labels that are easy to read and easy to change. • Transparent Sorter Shelves: The transparent sorting shelves let light pass in and through the sorter making stored documents and mail easier to see. • No Sharp Edges on Sorter Shelves: Mail sorter shelves are designed with no sharp edges to protect fast moving hands when sorting mail, documents and literature. • Ships Assembled: Sorting units come fully assembled, just open the box, set the sorter in place, and slide in the sorter shelves to use. • Choice of Sorter Colors: Hamilton Sorter has a large variety of color finishes to match any office décor. • GREENGUARD® Certified: Hamilton Sorter’s Closed Back Desktop Sorters are GREENGUARD® certified offering a green friendly addition to your desk and office. 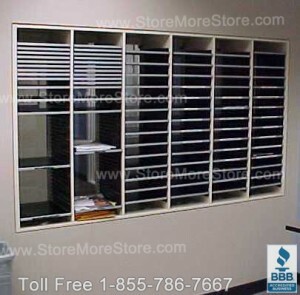 Shop today at StoreMoreStore for great deals on all types of mail and literature sorters! Whether you are looking for closed back sorters to sit on top of a table or desk or a freestanding full height sorter, you can find it at StoreMoreStore. We also carry mail sorting shelves, drawers, labels, trays and other sorter accessories. Don’t see what you are looking for? Call us today toll free at 1-855-786-7667 or send us an email, and we will help you with your mailroom and literature sorting needs.